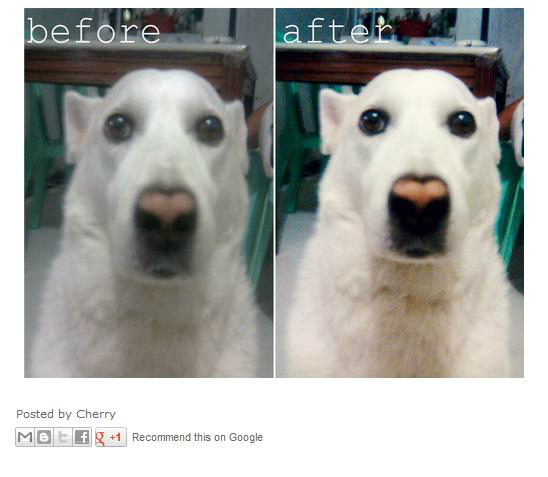 Before I drift off to dreamland (and it's way past my bedtime LOL), let me share with you the transformation that a fellow blogger, CHERRY of My Life Lately, did to an old photo of our beloved departed polar bear, oh I mean, dog ^^ Pikachu aka Chuchu. Obviously, the photo became sharper and more vivid. Chuchu's round eyes became more pronounced and the whiteness of his fur became more noticeable. Now, I miss Chuchu all the more T_T.